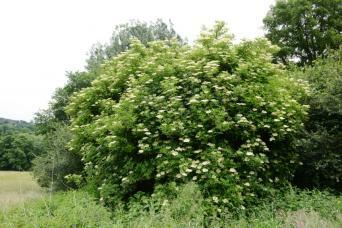 Elderberries are a showy group of shrubs valued for their edible berries and the wildlife habitat they create. They are relatively uncommon as landscaping plants, though they have many virtues that make them worthy of greater attention from gardeners. Though there are numerous species of elderberry native to both North America and Europe, from a gardener's perspective there are two main types. Varieties described as blue or black have edible fruit, though it is best to cook with it rather than eat it raw, and large, flat-topped creamy white blossoms. Red elderberries, on the other hand, are inedible by humans (potentially toxic) and have conical flower clusters. Red elderberries make a great wildlife planting (the birds enjoy the fruit) and bear attractive red berries, but overall have less desirable ornamental characteristics and are not commonly seen in nurseries. The charming form and delicious fruit of the blue- and black-fruited elderberries, however, have made them the more popular cousin among gardeners, resulting in the development of several notable cultivars. Incidentally, this group of elderberries also contains medicinal properties valued by herbalists that are not found in the red varieties. Elderberries typically grow as large deciduous shrubs eight to 12 feet tall, though they are sometimes seen as small trees up to 20 feet in height. They have a lush appearance overall, though some people consider their growth habit to be a bit gangly. The large, divided leaves and mottled bark are very attractive, but the enormous flowers, which can be up to six inches in diameter, are the main show along with the colorful fruit. Elderberries are excellent as an informal hedge species, though they are not generally considered for use in sheared hedges. They thrive in part sun, taking full sun in cool climates, but generally resenting locations with harsh afternoon heat. They need moderate soil moisture to grow well, but are tolerant of boggy conditions, making them an excellent choice for wet spots where many other species would fail. There are several improved cultivars worth trying among the various blue and black species. 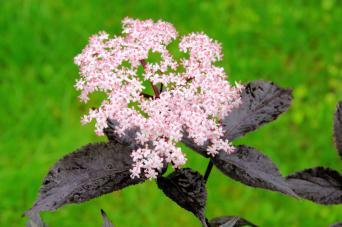 Black Beauty has stunning dark purple foliage and pink-tinged flower clusters. Variegated elderberries have a pattern of white and green streaks on the leaves. Lacinata has finely divided, fern-like foliage compared to the basic species. York is known for its extra large, extra tasty fruit. Weekly irrigation should be provided. However, elderberries planted in soggy places will never need any irrigation. The other primary chore is simply to give them a yearly pruning. This is best accomplished in fall, just after the leaves have fallen. You may wish to thin out some of the dense growth at the center, but most gardeners find that the shrub looks better if the long gangly branches are cut back significantly each year. It's fine to take off as much as 25 percent of the length of the branches. Elderberries are prone to a number of pests and diseases, though they are rarely a significant problem in home landscapes - and those that do appear are not easily remedied by backyard gardeners. Powdery mildew is one of the most common and is typically associated with shrubs that are planted in too much shade. They are also very susceptible to nematodes, so avoid planting them in any part of the yard where you know these underground pests are a prevalent. 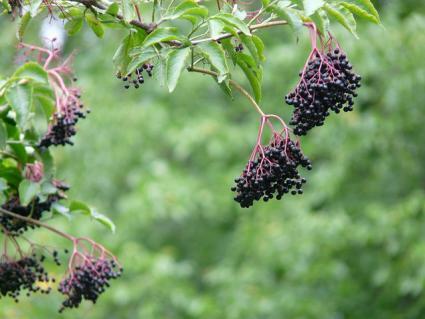 Many people plant elderberries specifically as a food source for birds and other wildlife. Of course, if your goal is to eat the berries yourself, these critters can pose a problem. It's not an easy problem to solve, but the best bet is to either plant enough to share with the wildlife or keep the bushes as small as possible with pruning and throw bird netting over the top several weeks before the fruit ripens. 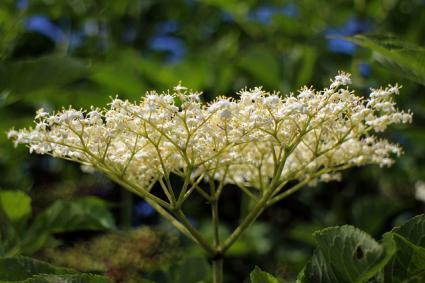 If you have a single plant that produces beautiful flowers every year, but little to no fruit, all you are missing is another elderberry bush to provide cross-pollination. Most are partially self-fertile, meaning they will produce some fruit without another partner nearby to provide pollen, but all elderberries produce much better when planted as a pair - or better yet, as an entire hedge. Aesthetically, elderberries are the opposite of the trim and tidy species that people most often plant as a hedge, such as boxwood. But they have a colorful personality that is a great fit for the right garden space and offer delicious summer berries as an added bonus.